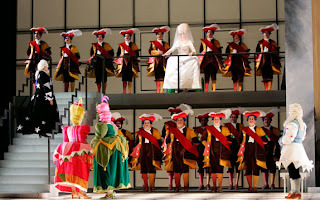 Seattle Opera Blog: ARIA READY: Dandini's "Come un'ape"
ARIA READY: Dandini's "Come un'ape"
These whimsical sets and costumes for La Cenerentola, as pictured here in 2007 at Houston Grand Opera, will be part of Seattle Opera's January 2013 production of Rossini's comedy. After fairy-tale happy endings to the serious stories of Turandot and Fidelio, our season moves on to one of the classic fairy tales of all time, Cinderella. We’re doing Rossini’s delightfully hilarious version of this beloved story, La Cenerentola, which is short on magic and high on personality and fun. Think of it as The Barber of Seville 2.0: it features pretty much the same singers and even some of the same music as the Barber. If you heard Lawrence Brownlee sing Almaviva at Seattle Opera in 2010, you heard a huge aria at the very end of the opera, “Cessa di più resistere,” which is cut more often than not. Not much happens in it, plot-wise (the young lovers have already defeated the old miser, at this point) although psychologically it’s an interesting piece in which this young guy, who’s been pretending to be other people all night long—a starving student, a drunken soldier, a foppish music teacher—finally becomes the willful, glittering nobleman we know from The Marriage of Figaro. But Rossini himself cut that aria from Barber and used it, nine months later, to end La Cenerentola. In this opera he gives it to Cinderella, again at the very end of the opera, when she is no longer a servant but has become the princess. Mezzo sopranos stole the aria from tenors, with Rossini’s blessing, and have loved singing it ever since. But for ARIA READY this week we’ve chosen another of La Cenerentola’s wonderful arias: the show-stopper entrance aria for Dandini (the Figaro of this opera), who is the Prince’s valet and mischievous sidekick. If you don’t remember Prince Charming having a sidekick, in other versions of the Cinderella story, that’s because Rossini added himself to the story with this wonderful character. In Rossini’s version, the Prince (named Ramiro) doesn’t want to get married because all the girls in his kingdom are superficial, pretentious ninnies, like Clorinda and Tisbe, daughters of the unbelievably pompous Don Magnifico. So he exchanges identities with his servant, Dandini, in the hopes of finding a girl who likes him simply for himself, not for his royal title—and he’s already fallen for Magnifico’s pretty young housekeeper, Cenerentola, when Dandini arrives to invite the daughters of the house to his ball. Dandini, meanwhile, is having the time of his life playing the aristocrat. His aria, which comes complete with choral introduction and other characters supporting him vocally during the fast movement at the end (the cabaletta) is a parody of that classic eighteenth-century opera seria form, the metaphor aria. That is, the lofty, noble characters in most operas of the two generations before Rossini always sang arias that began with metaphors: “Like a river rushing toward the sea, so I am determined on achieving my goal...” or “Like a serpent who has been bruised by your heel, I shall slither back for vengeance...” or even “Like a rocky crag, firm against the buffets of sea and wind, my soul stands firm in its faithful love!” (The first two, from Handel’s Giulio Cesare; the third, another mock-metaphor aria, from Mozart’s Così fan tutte.) Dandini’s metaphor compares himself, false prince on this bride-quest, to a bee buzzing from flower to flower. But in the fast section that concludes the aria, he turns straight toward the audience and sings, over and over again in tongue-tripping patter, that what now seems a comedy will become a tragedy, for the arrogant and unkind. Rossini’s music tells us exactly how much glee and delight Dandini will experience as he watches the downfall of Magnifico, Clorinda, and Tisbe. CHORUS: Hurry, choose a wife before the summer is past. Otherwise your royal lineage will die out. DANDINI: Like a bee on an April day, flying from rose to rose, seeking out the sweetest blossom, I’m dashing back and forth between all the beautiful maidens. I’ve seen many a beauty but I haven’t yet found one delectable enough for me. CLORINDA AND TISBE: Such a grace you bestow on us! DON MAGNIFICO: What a flood, a bottomless pit of honor! Jean-Pierre Ponnelle directed wonderful movie versions of both Il barbiere and La Cenerentola, arising out of productions at La Scala conducted by Abbado. Here’s Dandini’s entrance aria, staged by Ponnelle with precise comic movement in the ancient Italian tradition, sung by Claudio Desideri. Francisco Araiza played Ramiro in this film (Cenerentola, who doesn’t appear in this scene, was a gorgeous young Frederica von Stade), with the great Paolo Montarsolo as Magnifico and Margherita Guglielmi and Laura Zannani as Clorinda and Tisbe.